If you’ve been waiting far too long for that next Bridget Jones sequel (which is due out in September, by the way), you can stop waiting. There’s a new Bridget in London Town and her name is Nancy, except sometimes she answers to Jessica. 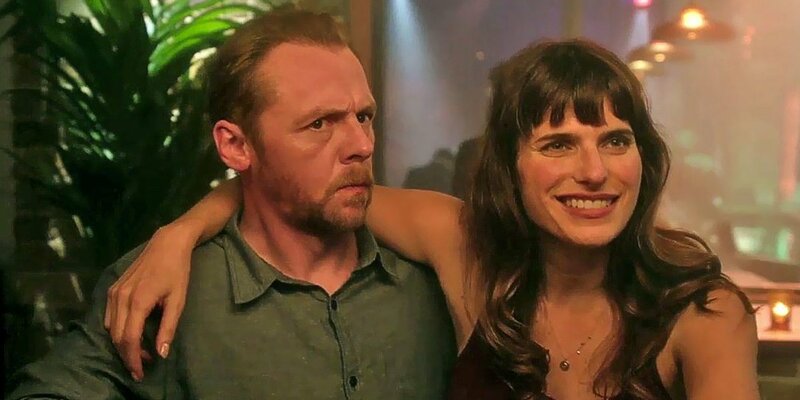 In the unfortunately titled film, MAN UP, Lake Bell (NO ESCAPE) plays the 34-year-old misfit who can’t seem to muster up the courage to get out there and find a guy before her biological hourglass runs out of sand. (Yes, I know that 34 is young these days and I’ll get to that.) One day, on her way to her parents’ 40th anniversary party where she is expected to deliver the toast to the happy couple, a perky, 24-year-old woman named Jessica (Ophelia Lovibond, who will be seen shortly in the film TOMMY’S HONOUR) strikes up a conversation with her on the train. Jessica is reading the latest self-help sensation, 6 Billion People and You, and she recommends the book to Nancy. Jessica also tells Nancy that she’s headed to Waterloo Station to go on a blind date. They’re to meet under the clock there, each holding their copy of the book. Nancy, however, is far too jaded to buy into any such romantic notions, so she rebuffs both Jessica and her suggestion. A quick cut and the train arrives at Waterloo Station. Nancy awakes to find that Jessica has gone, leaving the book behind. Through a combination of both bad and good timing, Nancy finds herself under the clock and holding the book just as Jessica’s date, the 40-year-old and newly-divorced Jack (Simon Pegg, the new STAR TREK franchise), arrives. Taking everyone’s advice to put herself out there, she throws caution to the wind, and decides to pose as Jessica and steal her date. She and Jack end up having a blast until Nancy is forced to tell him who she really is. With any rom-com, the ending is a foregone conclusion so whether a film works or not depends upon the journey the characters take to get there and the how well the actors can pull it off. With MAN UP, both are moderately successful. The story takes some fun twists and turns along the way, none more so than when Nancy runs into Sean (Rory Kinnear, SPECTRE), a former classmate who just so happens to still have a crush on her. Kinnear nearly steals the film with his over-the-top performance as the sexually unfulfilled man-boy. Though we don’t know for sure, Sean is probably the type of guy who still lives with his parents and who dreams about the glory days in high school that were never his. Unfortunately, the film’s final act plays this joke for laughs a bit too long and the slapstick humour starts to wear thin. Where the film works and works well is with US-born and raised Bell, who does a British accent that is so pukka, she apparently even fooled the film crew into thinking she was a local girl. In many interviews, she said that playing a Brit had been something on her bucket list since attending drama school in London years earlier. She did herself and the Union Jack proud here. As well, she has excellent comedic timing and she does some fine work engaging in rapid fire banter with Pegg, who rises to the challenge. Like Bridget Jones, Nancy is goofy, vulnerable and smart at the same time, and Bell ably shows all these sides of Nancy’s character.